Every week, we'll be sitting down with one of our gallery artists to discuss their work, process, inspiration, and stories. This week we're speaking with Tracey Adams. Tracey Adams' work is driven by her musical background, the intersection of opposing forces, and externalizing internal worlds. 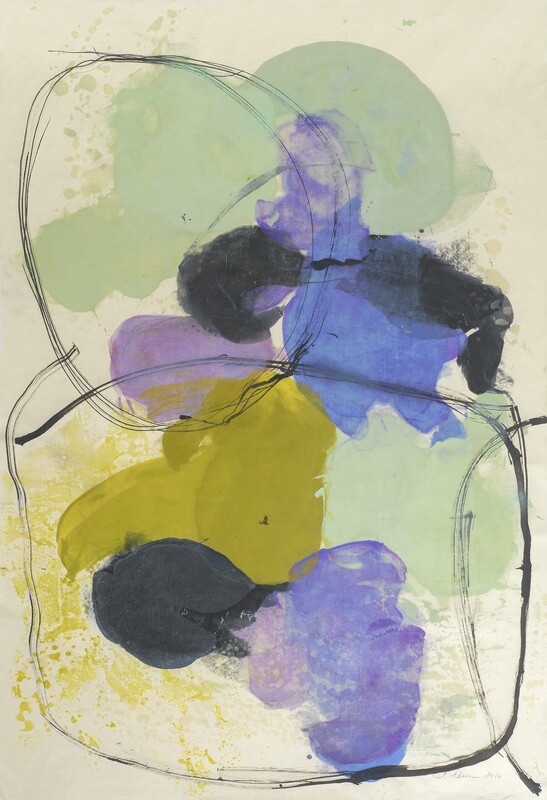 The musicality to her work is present in the gestural marks and repetition of pattern throughout each series as she moves from one focus to the next. Her "Guna" series is a departure from her previous work as she breaks free from geometry and concise patterns to create more intuitively and focus on unpredictability. 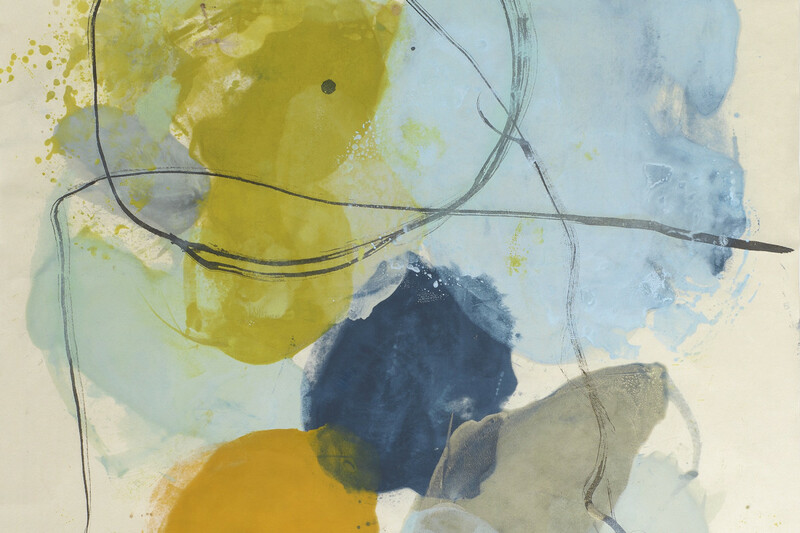 The interplay of pigmented wax and ink react to each other around the plane, activated by unexpected color combinations, careful use of negative space, and graceful line. 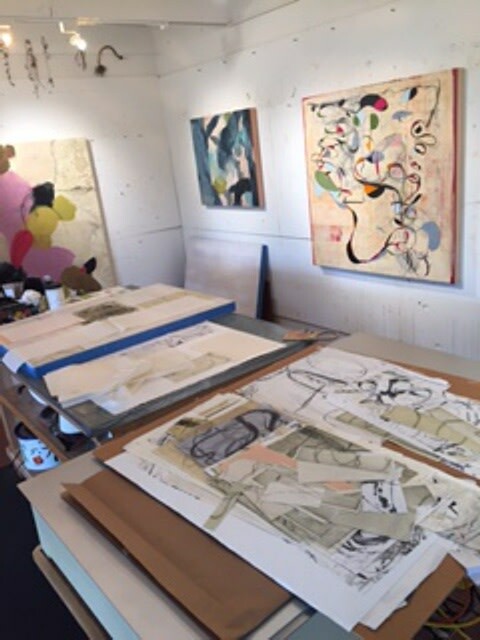 Adams spoke with us from her studio in California about what inspired the "Guna" series, what area of exploration she's turning to next, and why she never worries about running out of ideas. I grew up in Los Angeles, close to UCLA, but in one of the more rural canyons. My parents had a deep love and respect for art. My mom was a ceramicist with a home studio, which meant I got to work alongside her in her studio as a child. Every weekend, we'd go to a concert, opera, ballet, or art exhibition as part of UCLA's children's programing. 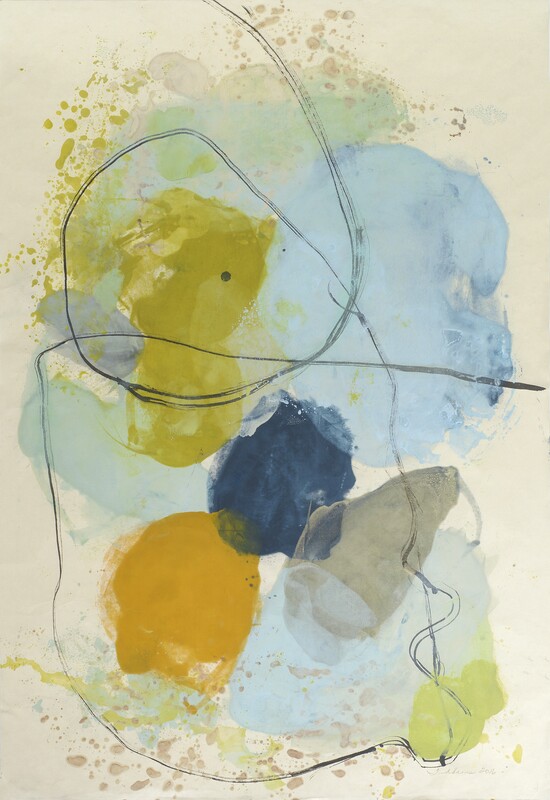 I started painting and playing the piano at age 3 and, at 5 years old, my mom entered a painting, Hot Dogs and Arrows, in a juried exhibition. This painting was about pattern and motion--many colorful, flying hot dogs and arrows in space. (It took third place!) During this time, my father had a Japanese business partner who gave me Japanese papers and taught me about origami. My parents had started collecting Japanese prints too, and so my minimalistic aesthetic was cultivated at an early age. Each summer as an adolescent, I attended the Idyllwild School of Music and the Arts where I studied painting. Jumping ahead a few years, I studied music composition in college and went to graduate school at the New England Conservatory of Music. I really missed drawing and painting and set up a small studio in my apartment in Cambridge. Every Wednesday night, I'd take figure drawing classes at the School of the Museum of Fine Arts in Boston. Soon, I enrolled in printmaking classes and began to realize making art was what I really wanted to do with the rest of my life, not music. The conservatory would use my drawings and paintings for their album covers, reinforcing my desire to become an artist. What draws you to working in series? Even though they are typically different visually, are there any elements that connect all of your work? I have a mathematical and organized mind and this is part of the mix that keeps things interesting. When I lived in Cambridge, John Cage was in residence at Harvard University. I spent a lot of time going to his lectures, listening to his music, and reading his books. Cage's chance operations or indeterminacy have always fascinated me and I've experimented with my own interpretation of chance over the years. Indeterminacy in music has been described by Cage as when "any part of a musical work is chosen by chance, or if its performance is not precisely specified." I like to describe my work as being on the continuum between gesture and geometry, sometimes more in one direction than the other. I work in both ways as a means to discover and explore, to find new ways of approaching my work. When I work in series, I can alter one element like color, rhythm, shape, etc. and create various iterations of the original piece. When I look back on work from the last thirty years, I see my hand in it, similar mark making to when I was a young. Beauty is my guiding principle. I find beauty everywhere: in decomposing plant matter, cells, as well as the ocean, kelp and tree limbs. The jazz musician, Charlie Haden said, "We're here to bring beauty to the world and make a difference on this planet. That's what art forms are about. I'm always searching. It's the reason I'm here. It's not about music: it's about searching for meaning". Haden was a fantastic improviser of jazz who believed in living in the present moment, something improvisation teaches you. What is your process like for the Guna series? I begin by melting pigmented wax on a Roland Hotbox™ and "paint" with various silicone tools that allow me to push the wax around to form whatever shapes and lines I'm working with. Using Japanese paper - currently I use Okawara - I dip the paper in the melted hot wax until it soaks into the fibers of the paper. I repeat the process multiple times, overlapping the shapes with transparent color. Sometimes, I add some gestural lines with ink. As with most monotypes, whether created on an etching press or the hotbox, I usually make a number of unusable images before I like something. I'm my worst critic, of course. I started making collages about 10 years ago in an attempt to use the fragments from pieces that were unusable. I delight in the materiality of what I'm doing and in experimenting until I land on something I want to pursue. When working, I often ask myself, "What would happen if …." and then I do just that. Sometimes I'm surprised by the results, other times, it doesn't work. What was your inspiration for the Guna series? What does it explore? Guna is a Sanskrit word that appears in many medieval Indian texts. It can mean string , thread, rope or (musical) chord, depending on the context. It's also used to describe qualities of balance, harmony, and creativity in Hinduism. There are 3 gunas (or qualities) that emerge creating the essential aspects of all nature: energy, matter and consciousness. It is much more complex than this explanation, but I hope you get the general idea. I've been practicing yoga since 1975 and enjoy exploring my thoughts and how they fluctuate between the different gunas. Could you talk about your relationship with color? How do you go about choosing the palette for each piece? Color is probably the most important and emotional element in my work, especially in the Guna series. My palette is generally warm, a reflection of life on the central coast of California. I love mixing colors and juxtaposing unlikely combinations, creating a sense of tension and release. 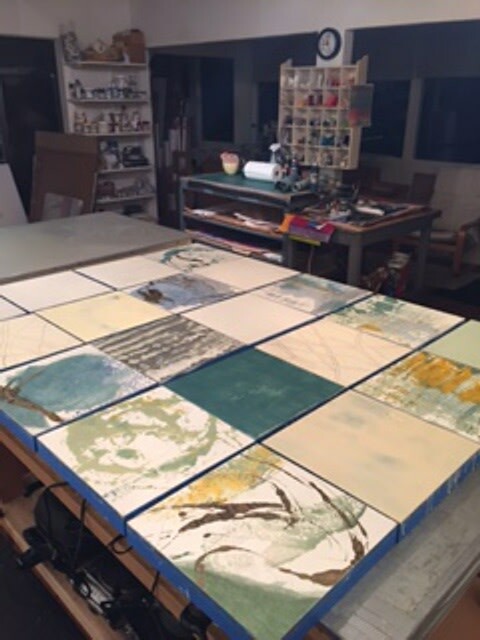 I make many test strips of colors and move them around on my worktable before beginning a monotype or painting. Your work that you made during the summer did not use encaustic. Do you think you may be moving away from it altogether? What differences in your work do you notice when you're not using it? I enjoy working with different media, depending on what I'm trying to express. I've worked with encaustic for almost 20 years so I doubt I'll totally give it up. The luminous and often unpredictable qualities keep me coming back. 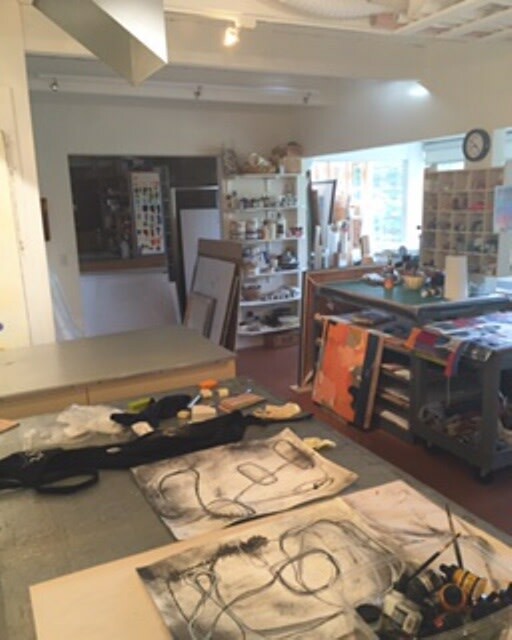 Encaustic requires heat and equipment, which is why I'll often pick up graphite, ink and gouache and draw. My drawings are much more gestural and graphic than the billowy shapes seen in the Guna series. Where do you see your work going from here? Are you working on another series already? I never know where my work is going nor do I worry I might run out of ideas. I enjoy revisiting past series after a break to see if I have anything else to say. I'm also working on a project that will incorporate some of the work created with my recent Pollock-Krasner grant. It's a collaborative project with a Denver-based installation artist and a chemistry professor from UC Santa Cruz that focuses on the medicinal properties of plants from the sea. The shapes of plant extracts from the ocean, when mixed with bacterial cells, then seen in Petri dishes under the microscope are beautiful and similar to some of the marks I've been making. I'm interested in the intersection of music, art and science -- this is why I doubt I'll ever run out of ideas or iterations in my work. Additionally, I'm always working on collages and move back and forth from printmaking and drawing to painting. See more of Tracey Adams' work here. Incredible sensitivity and lightness, giving the work an ephemeral quality. Your Guna series are very captivating. Wonderful questions Kathryn and delightful answers Tracy! Thank for sharing.